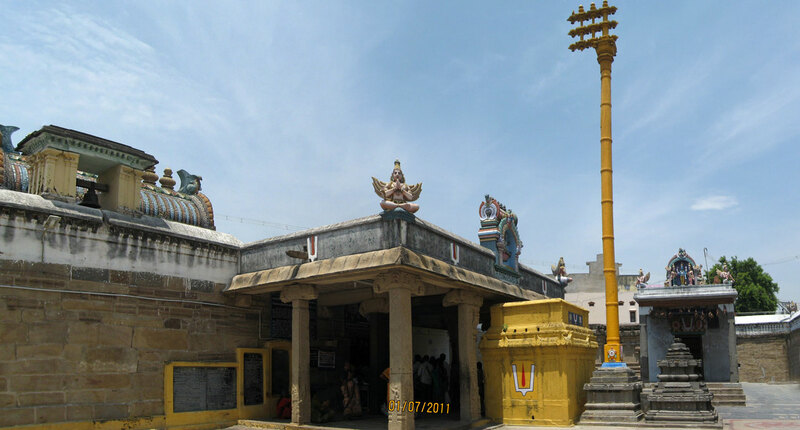 Sri Ulagalanda Perumal Temple is one of the 108 Divya Desams of Lord Vishnu. 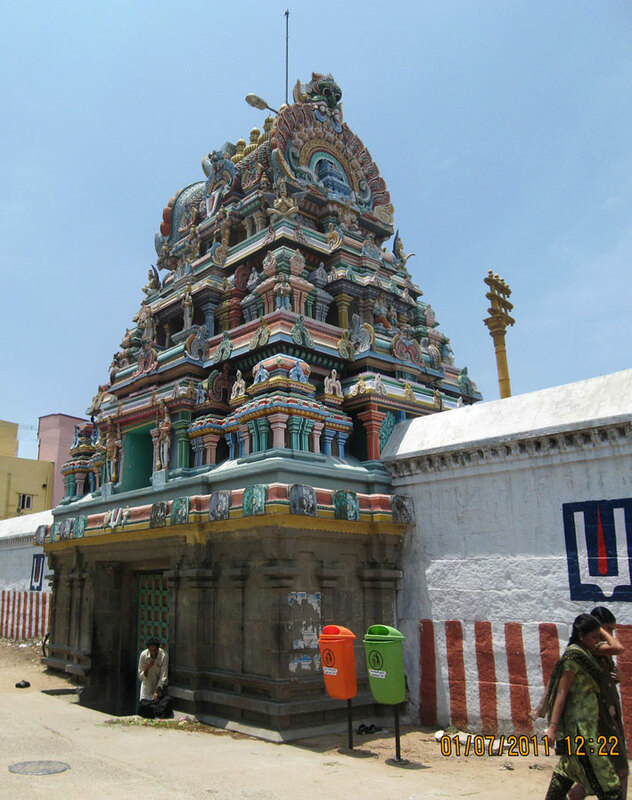 This is one of the oldest temples located on east side of Sri Kamakshi Amman Temple of Kanchi. The temple inscription reveals that it was built during the regime of Chola Dynasty. 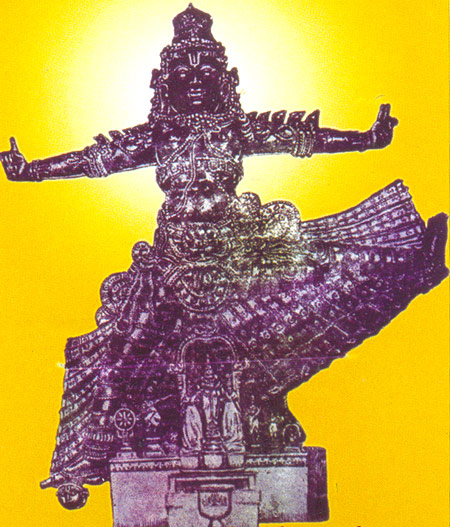 The main idol of Lord Trivikrama is 35ft and there are sannidhis dedicated to Karakathan, Oorakathan, Neerakathan and Karvanathan within the temple premise. Lord Vishnu is normally seen in one of the three postures- Standing, Sitting or Sleeping posture. From that point, the Ulagalantha Perumal at Ooragam is no different. However, while he is seen standing facing west, this is no simple standing posture of the Lord. This unique posture of the Lord is detailed below in this story that relates to Lord Vishnu’s Vaamana Avataaram. Lord Vishnu who took the Narasimha Avataaram to kill Hiranyakashipu, the father of Prahalada then took the Vaamana Avataaram, the first avataaram of Lord Vishnu as a human being, to subdue the demon king MahaBali, the grandson of Prahalada, and to restore Indra’s power back to him. King Bali had conquered almost the entire world and had gained such power that he seemed irresistible. Indra looked up to Lord Vishnu to protect him from Bali and his fast expansion. Disguising himself as a dwarf Brahmin, Lord Vishnu attends a Yaagam undertaken by king Bali. Pleased with his presence, Bali greeted the Brahmain and asked him what he could give from his huge empire. Brahmin that he was and contended with what he had, the dwarf asked Bali for just 3 feet of land. Bali’s Guru, the knowledgeable and shrewd Sukraachaarya, who knew the intention behind the Brahmin’s visit, advised the King against giving him the 3 feet of land. MahaBali, who was a great devotee of Vishnu, was also known for his upkeep of Dharma. Having asked the Brahmin what he wanted and having promised him to give whatever he wanted, MahaBali would not go back on his word, even if something negative were to happen to him. And hence he readily agreed to part with the 3 feet of land. The Vaamana measured the entire earth and sky with one step and the heaven with his 2nd step. And having covered the entire universe with just 2 steps, there was no place left for the third step. When asked where he could place his 3rd step, King Bali asked the Lord to place it on him. And with this, Lord Vishnu placed his foot on King Bali’s head sending him into the nether world, thus marking bringing to end the purpose of his Avataaram. Bali, who was thus crushed, wanted to see the full form of the Lord who measured the entire world. Answering his prayers, Lord is said to have appeared before Bali at this place as Ulagalana Perumal (the one who measured the entire universe). Having been reduced to a normal human being in the nether world, Bali was not able to see the full manifestation of Lord Vishnu in this gigantic form. Hence, it is believed that the Lord appeared once again before Bali in a smaller form at this place as the serpent lord Aadiseshan. Emperuman has manifested in the form of Anandan (popularly known as Adhiseshan, the five headed snake) in this temple. He is present in a seperate sannidhi next to Ulagalandha perumal in Thiru Ooragam. 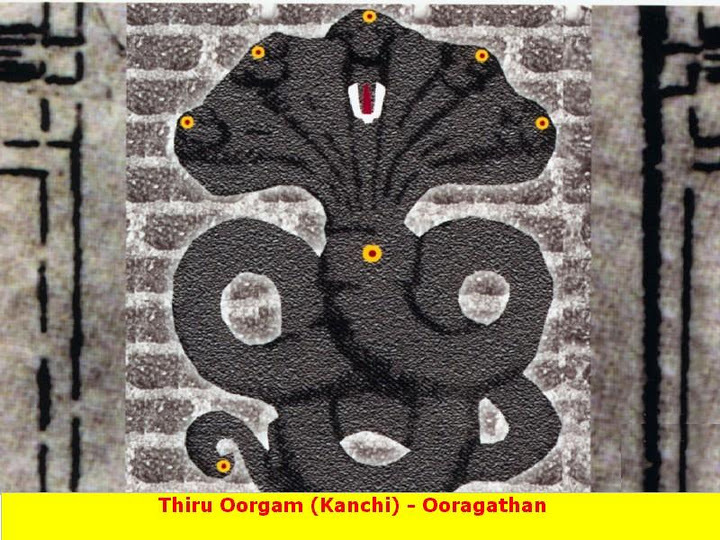 Ooragam signifies snake and lord Vishnu gave dharshan to Mahabali as the serpent lord, this place came to be called Ooragam and the lord is called Ooragathan. It is believed that this Lord fulfils the prayers of unwedded girls and childless couples. Left leg is seen lifted at a right angle(to the body), parallel to the ground. The gigantic Ulagalantha Perumal is special to Kanchipuram and a Lord of this size, and in this form, cannot be seen in any other Divya Desam. The temple is on the way to Sri Kamakshi Amman temple from Kancheepuram bus stand. This temple lies between Kancheepuram bus stand Sri Kamakshi temple.